Color: Navy/ Coral. Type: Girl's Cute Lace Print Dress. 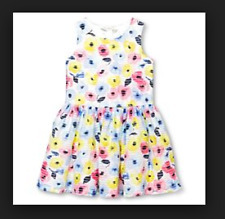 Size 12, will fit 10-12 yo girls, back zipper closer. From Dreamworks film, Spirit Riding Free". Whether she's a fan of the Spirit show or just likes horses in general, she'll love this Spirit Riding Free Big Flower Overall Dress. In a pretty shade of pink, this girls' overall dress will add a sweet burst of color to her wardrobe, while an embroidered graphic of Spirit will let her show off her fondness for horses. From sea to sidewalk! 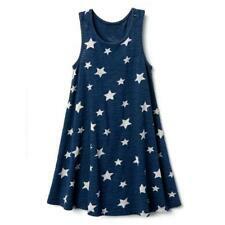 With its nautical stripes, our versatile girls dress makes a cute cover-up or an easy-to-wear dress. · Do not bleach. · Warm iron if needed on reverse side. · Heat transfer main label. 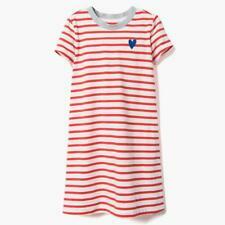 Girl's Vineyard Vines Short Sleeve Graphic Hoodie Dress Tee. •Color: "Yacht blue" and red whale print. NWT! 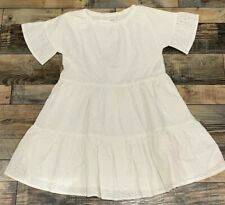 US ANGELS IVORY DRESS W/ ROSETTES DESIGN! GIRLS 10-12 $138.00+ MUST SEE!!! Our inventory is hand-picked one by one. The photos are exactly what you can expect. ~ Perfect Condition. Never Worn. We reply asap. Note: The photo may not reflect the exact color of the item as it will vary from computer to computer and the light in which the photo was taken, but I try to get it as close as possible. Top of shoulder to bottom (length): 31". Picture may be of a different size. Wonder Nation Girls SZ 10/12 Navy Red Dress and Plaid Jacket, 2-Piece Outfit - sparkle tulle skirt part of the dress. Dress is short sleeve and jacket is long sleeve. Suspended Neck Floral Print Midi Dress. Color: Peach Floral. All-over floral print, with contrasting border print at hem. Due to computer screen differences, item color will not be a reason for the item being misrepresented on my part. STYLE: DRESS. M;100% COTTON COLOR: WHITE. 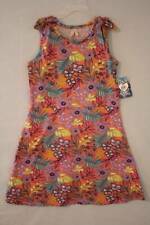 Girls' Night Kid Dress billabong. bohemian print. Girls boho maxi dress. Lace trim at hem. Square neckline. Good Condition to wear. White, Yellow, Blue Striped. Art Class High Neck Tank Top Dress. 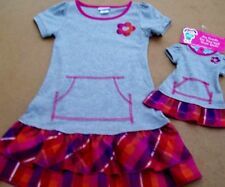 Girl's Size Large 10-12.